Dial-in at 2:00 PM: 917-962-0650. When asked, enter the Conference Code: 814705. Note: there is room for up to 15 to join by conference call. • Learn what can be done instead of bus system cuts, from our presenter and meeting moderator. • Learn what you can do to make your voice heard. • Sign a petition demanding a better study and solution. • Say how you feel on video for YouTube and Facebook. • Learn how to contact your legislators. • Participate in town hall conversation. • City service that does not have normal fixed route stops. • Stops that will cause people to transfer more often at extra cost to riders. • Will eliminate city paratransit completely. • Will cause delays for transfer stops and deviation. • People could lose jobs if late getting to work frequently. • People could be denied medical care if late for appointments. Reminder: the June 2 meeting is to prepare for the public meeting with Clinton County officials on June 5, 10:00 AM, also at the Clinton County Government Center. Please plan on attending that meeting as well. Will you join us in documenting accessibility for people with disabilities in the North Country? This July it will be 27 years since the Americans with Disabilities Act became law. Yet, it is at least as common to find businesses and public facilities that are not accessible as it is to find ones that are. If you have disabilities, or are family or friend to a disabled person here in the North Country, you probably know several places you just can't go ... because wheelchair users can't get in, or go to the bathroom ... or because people using crutches or canes hate going there because there are too many stairs ... or because blind people find it's too dark and the print is too small on the menus. We complain about it, but despite the backing of a nearly 30 year old federal law, it often feels like there's nothing we can do about it! 1. Everyone who is interested, if you have the equipment, visit the AbleRoad website, and / or download the AbleRoad iOS or Android app, create a free account, and start giving 0-5 star accessibility ratings on local places you visit. 2. Keep a simple list of the places you rate, and every now and then send it to NCCI so we can keep a running tally of places rated by our whole team. 3. Tell friends and family what you're doing, how they can do it too, and more importantly, how they can use AbleRoad accessibility ratings to access more of their community. The AbleRoad website and iOS and Android applications allow people with disabilities and medical conditions - including those who use a wheelchair or have other mobility, vision, hearing or cognitive disabilities - and their families and caregivers to review any public space or business. Each review helps people with disabilities "to know before you go" the accessibility of a restaurant or business. Accessibility is required by law, but we know that is not always the situation. Don't be caught by surprise. Know in advance whether a place is accessible for people with your disability. We will probably also schedule a few in-person events during the summer, to introduce people to the project and app, and make bigger, more coordinated efforts to rate a bunch of businesses at once. Stay tuned through NCCI's Website, Facebook, and Twitter! Clinton County Public Transit (CCPT) is considering the elimination of its paratransit service, and replacement of the paratransit service with deviation of all city routes. The paratransit service is intended to provide transportation for individuals who have disabilities which prevent them from using the regular public transit bus routes for any number of different reasons. All CCPT vehicles are accessible, meaning all the vehicles have wheelchair lifts. The most common obstacle preventing an individual from using the regular public transit bus routes involves difficultly for an individual to get to a bus route. As an alternative to paratransit service, CCPT would deviate from the regular routes up to ¾ mile off-route in order to pick up any passenger who requests the deviation in advance. The deviation request would need to be made at least the day before or up to two weeks in advance. There would be an additional fare for a deviation. The Paratransit Service is subject to specific regulations which do not allow for capacity constraints, meaning that the County is required to approve every request received with an allowance that compliance is achieved if the request is granted within a one hour window of time. Requests for paratransit trips have doubled over the last eighteen months and CCPT is unable to provide all of the trips being requested with current resources. This capacity constraint situation necessitates either an expansion of paratransit service or replacement of the service with an alternative. Additional vehicles and operating costs to expand the paratransit program to meet demand would cost local taxpayers hundreds of thousands of dollars. An analysis of paratransit use indicates that most of the trips currently being provided by paratransit could be provided instead by deviating the regular routes. This alternative to paratransit service would transport more passengers per run and would be a more efficient and therefore less costly way to meet the transportation needs of the community. The deviation service would be less convenient for some paratransit users because some passengers may need to transfer between bus routes on the deviation service, whereas the paratransit service is origin-to-destination. The idea of eliminating paratransit service and replacing it with deviating routes is intended to protect the transit program from compliance concerns while balancing the transportation needs of the community with the burden to taxpayers. CCPT is seeking public participation in the planning process. 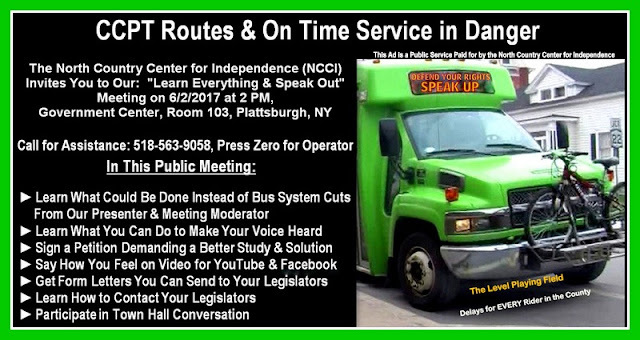 There will be a Public Meeting on Monday, June 5th, in room 103 of the Clinton County Government Center; 137 Margaret Street, Plattsburgh, New York from 10:00 am to 12:00 pm. Any person interested in learning more about the proposed change and how it might impact the transit services provided are encouraged to attend and participate in an open discussion about the possible elimination of the Paratransit service and replacement with deviation service. Interested transportation providers and human service agencies are invited to a Coordinated Transportation – Human Services meeting scheduled on Tuesday, June 6th, in room 103 of the Clinton County Government Center; 137 Margaret Street, Plattsburgh, New York from 10:00 am to 12:00 pm. This coordinated transportation meeting will be open to the public to observe but the focus will be a discussion between stakeholder agencies on identifying the transportation needs of the community, meeting those needs, and on how various agencies can coordinate efforts to do so. Public input will be limited to five minutes per person at the coordinated transportation meeting so that the agencies can focus on their collaboration. The Clinton County Planning Office is preparing a recommendation to the Clinton County Legislature to ELIMINATE Paratransit services in Clinton County. The plan would instead offer only route deviation services on city fixed routes and expanded rural zone services. A notice of public comment is expected to be posted via legal notice in the next few days. A public meeting will also be scheduled, probably for early June. We will need EVERYONE to be there. NCCI will explore all possible legal options and we will be involved in advocacy with the Clinton County Legislature to hopefully stop this from happening. Please be prepared to help us by responding to action alerts. We need the whole community to help us fight this. Above all, please stay alert for new developments, events, and opportunities to comment. Be prepared to tell the County how the loss of Paratransit would affect you and / or your loved ones. Action Alert: Call-In Day to Protect Medicaid and Health Care! Senior officials in the Trump Administration have announced that the House of Representatives will vote on Wednesday, May 3, for an amended version of the American Health Care Act (AHCA). These amendments have made the bill even worse for people with disabilities and eliminates many of the protections for people with pre-existing conditions enacted as part of the Affordable Care Act (ACA) during the Obama Administration. We need you to take action! Join the national Call-In Day TODAY, May 2, and tell Congress to protect Medicaid and healthcare for millions of Americans. Your representatives will also listen to state officials, especially governors, about issues that impact your state and your governor needs to hear from you as well. If you need help figuring out who your Representative is, go to www.house.gov. Click here for contact information for our Members of Congress from the North Country and New York State. As a constituent and a [person with a disability/parent of a child with a disability/supporter of people with disabilities], I oppose the passage of the American Health Care Act. The new amendments makes the AHCA worse! The amendments allow states to waive protections for people with pre-existing conditions. They also would allow health insurance companies not to cover Essential Health Benefits, such as mental health and substance use disorder benefits, and to charge people with pre-existing conditions more for health insurance. These protections for people with pre-existing conditions, including people with disabilities, must be maintained. And the AHCA still causes 24 million people to lose health insurance! These amendments did nothing to improve the tremendous problems that the AHCA already posed for people with disabilities. The American Health Care Act still cuts 25% of Medicaid's budget and changes federal reimbursement rules, which would gut critically needed services for people with mental illness and other disabilities. These services include healthcare services in the community for people with serious mental illness, employment services, services that help people stay housed, and services that help students learn in school. Medicaid is the main funding source for these services. The American Health Care Act still repeals the ACA's Medicaid expansion, which has enabled millions of adults and children with behavioral health conditions to gain health insurance, including coverage of mental health and substance use disorder services. If the expansion is repealed, those millions will lose their insurance. Combined with the cuts to Medicaid, the Congressional Budget Office estimates the AHCA will cause 14 million Americans living in poverty to lose their Medicaid coverage, including millions of people with disabilities. Make your voice heard in Congress to protect health care!